We have one goal in mind… well, two actually. Exceptional eyecare and having fun. But, we like to lump them together into one because we make eyecare FUN! How, you ask? Well, our team makes your eyecare experience, a one-of-a-kind-experience from the moment you walk through the doors to the moment you leave. Because of our commitment to exceptional service and state-of-the-art eyecare, we have grown Maple Grove Eye Doctors into an eyecare destination. We are committed wholeheartedly to our community giving back wherever and whenever we can, showing our support and participating in the growth of Maple Grove. So, when you have a chance, stop by and see what we’re talking about, or book an eye exam. It will be exceptionally FUN! Our team strives every day to accomplish the optimal vision for every single one of our patients by doing things a little bit different than the other guys. Our team of opticians gives extra care in making sure we provide better fitting frames, better function with your lenses which will be designed with your personal and work life in mind, and with a better look and feel than most are accustomed to having. We believe that life is enhanced through better vision, so we don’t make it an afterthought. We make it a priority by continually updating our technology, our frame selection, and our overall patient experience. It began in January of 2011 when Jim and Donna purchased the business, which has been in its exact location since 1994. 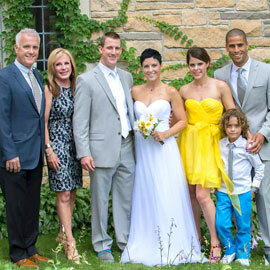 Their daughter, Brooke came on board as the General Manager – Co-Owner in March of 2011 and began transforming the operation of the Maple Grove Eye Doctors team, into what it is today, by reworking the entire operation of the business, from the way patients are welcomed to the way every aspect of the business is built around customer experience and satisfaction. We’ve grown our team to include some of the most amazing professional optometrists, opticians, and technicians who work in our state-of-the-art onsite lab, surrounding ourselves with those who inspire us and make us want to be better. Thank you to those who believed in us and to whom have trusted us, with their beautiful eyes!